If you’re looking for comfortable and eco friendly nappies for your newborn baby then these Bambo nappies are perfect for you. They are made with extra soft materials which have been responsibly sourced from sustainable forests, and are dermatologically tested to ensure they don’t irritate your baby’s skin. This pack of 28 newborn nappies is perfect for babies between 2-4kg/4-9lbs, and the thin, breathable design ensures maximum comfort. Features the Nordic Swan Eco Label. The fluff is made from biodegradable and FSC Certified materials. No added Parabens, SLS, SLES, Synthetic fragrance, Phthalate, petrochemical, Alcohol, hydantoin, triclosan or triclocarban. The manufacturing facility in Denmark, recycle 95% of all production waste. Raw materials characteristics: Absorbent core: 100% cellulose fluff, ECF chlorine free Sub-layer: Polyethylene (PET) and polypropylene (PP), white Non-woven: Polypropylene (PP), permanently hydrophilic non-woven Cuffs: Polypropylene (PP), hydrophobic Elastics: Elastan. Polypropylene (PP) Backsheet: Breathable textile backsheet (BTBS) Adhesive: Hotmelt (glue) sprayed between layers. Is based on resin and wax and does not contain phthalates SAP: Superabsorber, permeable polyacrylate, does not contain phthalates Tape: Polypropylene (PP) tape, hooks for repositioning Frontal tape: Polyethylene (PET) and polypropylene (PP). 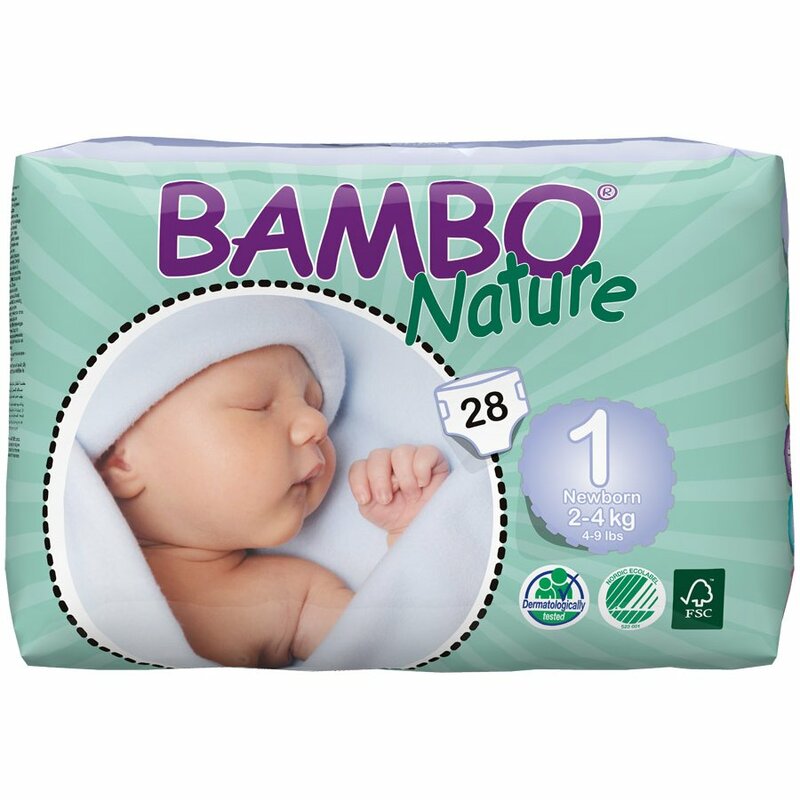 The Bambo Nature Disposable Nappies - New Born - Size 1 - Pack of 28 product ethics are indicated below. To learn more about these product ethics and to see related products, follow the links below. These nappies are fab! I've been using them throughout my babies life and have found them reliable, leakproof and gentle on my babies skin. I would highly recommend them. Gentle on my new-born's skin and no leaks. Nappy perfection. Introduced to these by a friend and have been very happy with the brand. I think it's worth the money if you use the reusable ones alongside. Don't irritate gentle skin and leak as much as the leading brands, I.e. rarely. 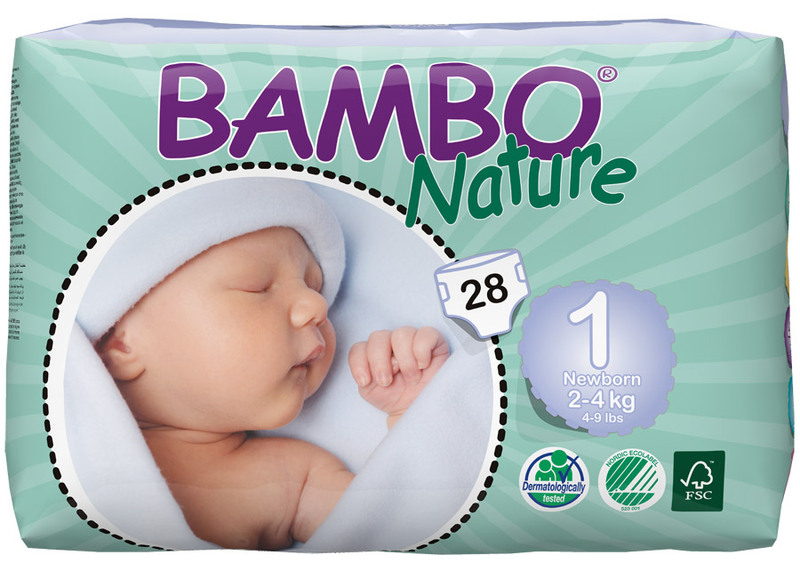 There are currently no questions to display about Bambo Nature Disposable Nappies - New Born - Size 1 - Pack of 28.